Applications for observerships are open from next Saturday 13. April 2019 12:00 CET and will be closed on Tuesday, 7. May 2019 12:00 CET. Now is the time to compile the necessary documents in order to send them with your application as soon as the link is open. Click here to read more information about the criteria and which documents are needed. Any questions, please contact observership@escmid.org. 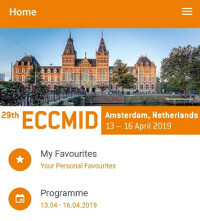 ECCMID 2019 App is Live! Have all of ECCMID 2019 in your pocket! Download the ‘ECCMID 2019’ mobile app from the App Store or Google Play. The App is the quickest and easiest way to navigate ECCMID 2019, set your personal calendar and submit session feedback! Combatting Antimicrobial Resistance in Europe (COMBACTE) is a key project of the European Commissions’ New Drugs For Bad Bugs (ND4BB) programme, which together with the Innovative Medicines Initiative (IMI) is part of the collaborative R&D efforts to tackle antimicrobial resistance. On Monday, 15th of April, 19:00 – 22:00, COMBACTE is hosting a networking event for specialists from universities, hospitals, laboratories and the industry, and those interested to learn more about the private-public partnership and the academic milestones the consortium has reached. An invitation to the event can be picked up at the COMBACTE booth #1.84. Submissions for both Paper and Oral poster sessions are now open! Visit the meeting website for more information on abstract submission. Find out more about the Scientific Programme and venue on the ESCMID website. 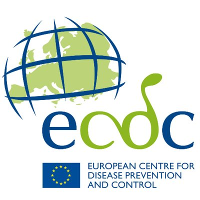 The European Centre for Disease Prevention and Control (ECDC) has proposed to prioritise the implementation of WGS depending on disease and public health application. To implement the proposed operations, ECDC is developing a set of digital applications that will be used to share, store and analyse sequence-based or WGS typing data. Data providers will be able to submit sequences and related data directly to the application, and data will be jointly analysed with a high level of automation to identify and visualise transmission signals and patterns. The ESCMID members wishing to comment on the manuscript may write to the ESCMID Publications and Medical Guidelines Manager to request the (confidential) draft of the manuscript along with the comments form for listing feedback. Email:joan.goulley@escmid.org for a copy of the draft guideline! A. Wolfensberger et al. developed and validated a semi-automated surveillance system for nvHAP, and describe nvHAP incidence and etiology at their hospital. Conducting manual surveillance of non-ventilator-associated hospital-acquired pneumonia (nvHAP) using ECDC (European Centre for Disease Prevention and Control) surveillance criteria is very resource intensive. The authors applied an automated classification algorithm mirroring ECDC definition criteria to distinguish patients ‘not at risk’ from patients ‘at risk’ for suffering from nvHAP. ‘At risk’-patients were manually screened for nvHAP. For validation, the authors applied the reference standard of full manual evaluation to three validation samples comprising 2091 patients. The authors show that their semi-automated surveillance method has demonstrated very high sensitivity, negative predictive value and accuracy. This approach significantly reduces manual surveillance workload, and thus making continuous nvHAP surveillance feasible as a pivotal element for successful prevention efforts.